Heliozelids are very small moths. The coloration and pattern are characteristic for each genus, and are very uniform within the two genera (Antispila and Coptodisca) in which multiple species occur, so that reliable specific identification of adults in those genera is best attained by rearing. Adults of Heliozela and Coptodisca are distinctive in appearance and thus are not likely to be mistaken for adults of any other microlep group. Adults of Antispila can be distinguished from Nepticulidae by the smoothly-scaled head and absence of folded maxillary palpi and antennal eye cap, and from small, similarly-colored gelechioids (e.g., some Elachista and Mompha spp.) by the unscaled haustellum. 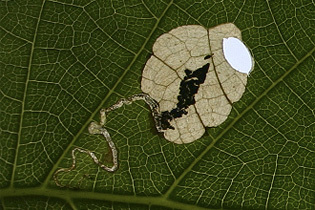 Larvae of Heliozelidae feed on leaves of woody plants, usually as full-depth blotch miners (in which case the mine begins as a serpentine track and subsequently is abruptly enlarged into a blotch). Frass is retained inside the leaf mine, where it can be seen as a black granular accumulation. When the larva finishes feeding, it cuts an oval-shaped piece from each of the opposing layers of leaf epidermis at the edge of the mine and ties the pieces together from the inside to form a lenticular case inside which it drops to the ground. The resulting oval-shaped hole in the leaf identifies the evacuated mine as being that of a heliozelid species in either Antispila or Coptodisca (Fig. 1). There are one or more generations per year, depending upon species. The insect overwinters as a larva inside the case, with pupation and adult emergence occurring the following spring. The pupal exuvium is protruded from the case upon eclosion. Figure 1. Antispila hydrangaeella. Evacuated leaf mine on wild hydrangea, Hydrangea arborescens (Hydrangeaceae), showing the early-stage serpentine track mine leading into the abruptly-enlarged blotch mine of the late-stage larva; also seen is the full-depth oval-shaped hole at the edge of the mine, indicating that the larva already finished feeding and cut out its pupal case, inside which it dropped from the mine. This oval-shaped hole is characteristic of evacuated mines of Heliozelidae in the genera Antispila and Coptodisca.